When I quit my job, bought a bicycle and rode out of San Francisco, most of my friends thought I'd be back within 3 weeks. With no map, no compass, my sense of direction was flawless. Hence the route from San Francisco to the Yucatan in Mexico via the Alaskan arctic circle. South America Bike Expedition (Chile/Arg.) 2006! 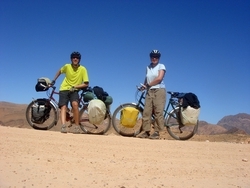 We are two Swiss guys and will start a bike expedition in Spring 2006 (sarting 03.04.2006) in South America. We will travel with our bikes about 2500 to 4000 km in 2 months. 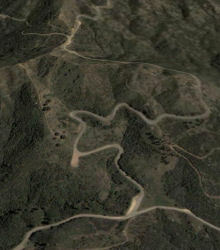 Our route will go through Chile and Argentina. Critical ways of the expedition will be the Altiplano and crossings of Andes, South America's highest mountain massive with routes over 5000 meters above sea level. Track our trip online via http://expedition.voegeli.li from 03.04.2006! we will update the site during our trip! This tour includes scenic detours around Greek islands, the Peloponnese, and proceeds through Italy, Austria, and Germany. 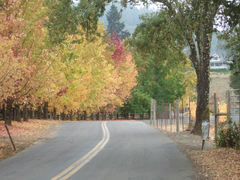 This site also has tours in the USA: Colorado, Wyoming, Montana; and in Portugal and Spain. We awoke to cloudless skies and a strong headwind. Breaking camp we hit the road only to learn that Saskatchewan highways don't always have paved shoulders. We assumed the alpha formation whereby Nick takes point and Dave is the rear guard. Appearing inebriated, Dave would sometimes swerve into the road to scare cars into the far lane. Making possibly the smartest decision of his life, Dave stopped to ask road workers if we could have two pairs of disposable earplugs to drown out the wind. These were great for the moral and allowed us to phase out of this world and create sci-fi stories which became entertainment for our breaks. As we were getting into Maidstone, Dave got a flat back tire. Inspection of said tire revealed multiple punctures: two staples, three pieces of glass and a small rock. These had all managed to work there way through Dave's ``Perfect'' (brand name) tire. Much to Nick's dismay Dave decided to swap front and back tires. This took a few hours since Dave makes bike repairs at a Tectonic pace. As we mounted our Cromoly steeds Nick realized that he too had a flat tire. (Just ask us about road tar, we dare you) Dave's response: You're shitting me, right?